Audio & Video Stream Recorder, Universal Converter. DVD Copier. Save your favourite movies and series from top quality video streams. Enjoy live television on the internet and make your own private video library. Tunebite saves music streams as individual tracks or audiobooks. This enables you to quickly make your own free, legal and top-quality music library. Netflix, Amazon, Hulu, YouTube, CNN, BBC and many other internet streams can be recorded. Audials is the only software to be optimized to adaptive streaming and the latest DRM mechanisms. This means you'll receive everything in top quality HD and as an MP4, HVEC, H.264 or WMV. With its preconfigured recording methods for every video streaming service, Tunebite is lightyears ahead of any other tool. It's comfortable to use and provides perfect results. Audials offers you 100 international live TV streams and dozens of the best music channels in a well-organized fashion. No other software can save music streams as individual tracks as quickly as Tunebite! It's able to open Spotify twice at the same time and record each session at 5 times the speed with no loss in quality! In Audials software, the optimal recording methods for the most popular video streaming services, video portals and media libraries come preconfigured. Simply click on the Audials tile for the desired video stream, then start the film and Audials Tunebite Platinum records it in the video format you want and optimized for any device. Netflix, Amazon and other popular online video libraries encrypt their video streams. The majority of tools cannot record such encrypted video streams. 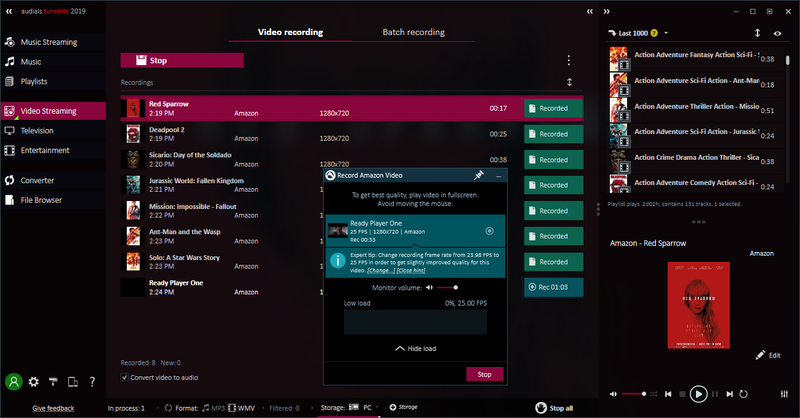 However, with Audials Tunebite Platinum you can record any type of video stream directly as you play it. Without any loss of quality and in its original size, Audials records both open and protected videos and films from any source and saves them as a legal private copy. Vimeo and other portals offer a multitude of music videos. With Audials you can easily save the soundtrack of a video from a video-sharing Website, for example, as an MP3 music track and then have all ID3 tags automatically added to it. Audials Tunebite Records Everything You Hear Online! Music tracks from your music streaming services, e.g. Spotify™ or Deezer™, are recognized as music, recorded from the stream and automatically saved with tags. Whenever you listen to a song on a website or in the player of a streaming program, Audials Tunebite Platinum can record it for you and automatically save it, for example, as an MP3 file. Audials Tunebite can play music from Spotify silently in the background and record it with no loss of quality. Audials Tunebite Platinum automatically records music streams with no commercials at the perfect volume, before saving your new files to your hard drive, cloud or smartphone in the best quality with ID3 tags. Music video playlists offer a wide variety of music with great audio quality. 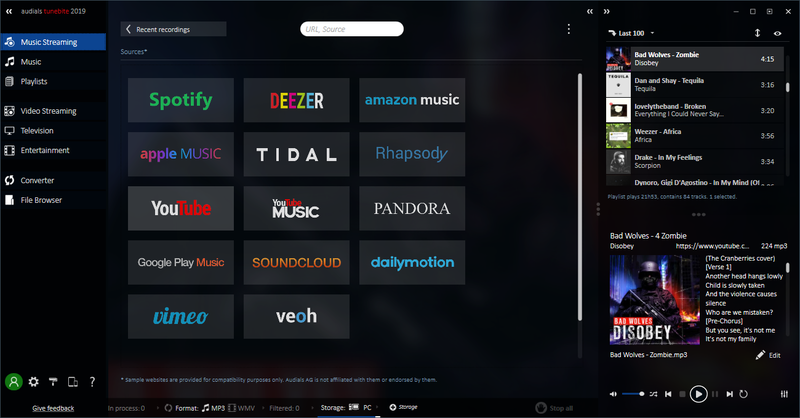 With the "Video portals" tile, it is easier than ever before to automatically save all the music videos you play on video portals, even including complete playlists. Audials then automatically saves the soundtrack from the videos in the highest quality and saves the music (e.g. as an MP3) with all of the ID3 tags, album art and lyrics as usual! 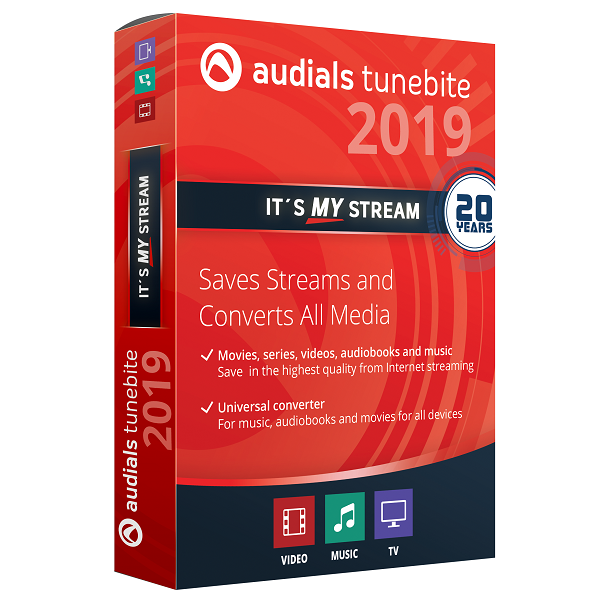 Audials Tunebite Platinum is a universal converter for all audio and video file formats on PC, smartphone, tablets, netbooks, notebooks, ultrabooks, games consoles and other devices. Music, audiobooks, videos and films are converted to any format quickly and in top quality. If purchased films and videos cannot be played back due to DRM copy protection or their file format, Audials Tunebite Platinum helps you and frees you from any problem: Using legal recording with the PerfectVideo quality guarantee, Audials Tunebite solves all copy protection problems, saves all films as new unprotected MP4, WMV or H.264 files, for example, and so ensures unrestricted enjoyment on all devices. 44 file formats are available for conversion. With Audials Tunebite Platinum, you can convert audiobooks with or without chapters for all devices. To do this, Audials Tunebite uses audio book libraries, such as Apple iTunes, as a virtual CD drive. Using virtual burning, Audials then saves audiobooks as MP3 files in top quality. Audials Tunebite has a unique innovation so that the quality of your music and audiobooks doesn't suffer. With PerfectAudio we give you our promise of quality with a well-developed process that only allows for top results. During recording-based conversions, for example, Audials Tunebite records the audio file multiple times and compares it with the original until the result is perfect. Of course you'll never need this many file formats. Nonetheless, Audials Tunebite fulfills the highest of demands and enables you to calibrate for playback by adjusting for codec, medium, bitrate and frame rate as well as frame size to achieve the optimal result. You can do this, for example, for playing a film on a device with a special screen size or lower specs. After all, it's better to have the expert mode and (thanks to the many formats and preconfigured device profiles) not need it than to need it and not have it. Using different software tools it is possible to create MKV files of Blue-ray films. However, not all devices can play the MKV video format. Audials Tunebite provides a solution here and converts films from Blu-ray films from the available MKV video format to new files in MP4, WMV, AVI or other video formats both reliably and without loss of quality. With Audials Tunebite Platinum, you can therefore enjoy your Blu-ray films on PC, smartphone and tablet too. You can play music, videos and movies directly in Audials with its integrated player. This can be done in a detached window, in the main window or in full screen. 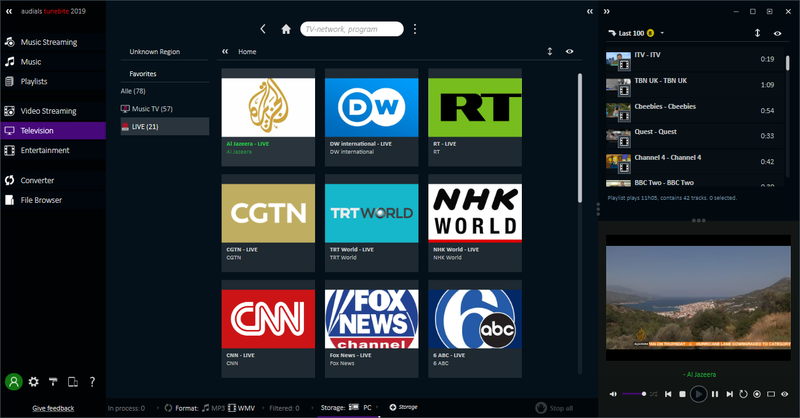 Audials Tunebite brings order in your media collection. The software enhances your music collection with ID3 tags and ensures consistent normalization of all tracks in your collection. Audials Tunebite Platinum brings you a video library sorted according to your criteria. 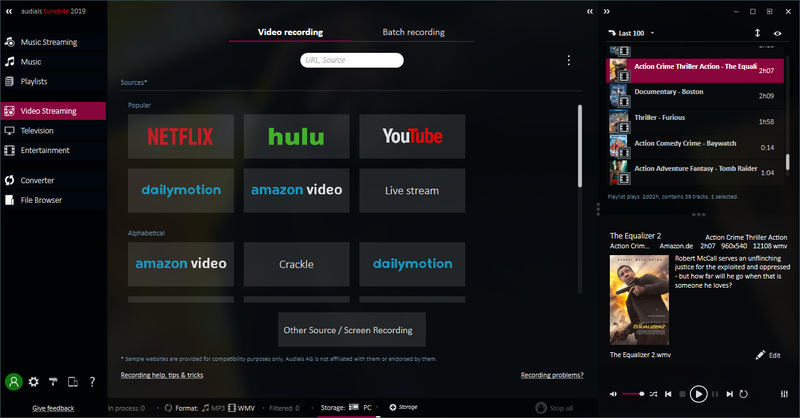 Using its connected video database, Audials automatically completes information for existing recordings and new films. Audials Tunebite fills up your smartphone or tablet. You can also use Audials Tunebite as a cloud manager and even turn your PC into a cloud.